Remembering all the songs in your song library can be difficult. Not to mention the key signatures and tempos. To deal with this, I like to create a Master Song List. This list will have all the pertinent information to help you recall or choose songs. There are many ways you can create such a list. I prefer making an excel spread sheet. This can really come in handy when you’re making a set list or choosing songs on the fly. Sometimes at a show you have to call an audible. A string may break, a piece of gear may fail, the keyboardist could have eaten bad sushi. I mean it was laying out in the green room for way too long but they didn’t want to listen. C’mon!! You can handle these situations like a pro when they happen (and they will). In the event of the “keyboardist” situation, I suggest a loud song to drown out the whimpering coming from the dressing room bathroom. Lets look at a scenario un-related to bad sushi. When I tour with Abby Ahmad on her solo project or our joint project Fife & Drom, we often play slightly different sets from show to show. Because of the complexity of our tunings it’s not easy to just pull songs out of the hat. 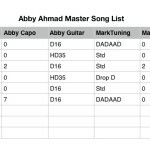 Therefore, we like to use a master set list with grouped songs based on similar tunings. This gives us all the info we need to select songs. 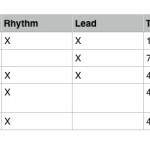 From this list, we arrange a set list that allows the most flow between songs and tells a musical story. There is that saying that by the end of your life you’ve spent six months at stop lights. Think about the amount of time you spend trying to remember songs you know? You could be using that energy on other things. The more organized you are, the better you can collect your concentration before hitting the stage. At this point your fans are checking their texts, playing candy crush or leaving to get a drink at another bar. Too much dead air is a silent train wreck. You never want to seem like you don’t know what you’re doing. Even if you don’t. Lets think about applying this to other situations. What about creating lists for songs you are practicing? You can keep track of your progress. Every time you sit down to practice you can pull out the list and see what songs you already know. You can even use these songs to try out new techniques and ideas. More practicing, less time dusting cobwebs. I see so many students waste time because they can’t decide what to play or figure out what they know. This is not a time to flex your memory muscle. It’s time to get to the point… PLAYING. You’re less likely to get caught in the rut of playing the same 3 songs. We’ve all been to a jam session when it’s your time to pick a song to play. You mumble as you try to think of the songs you know. You’ve learned tons of songs but only the songs played this week come to mind. If you have your list, you won’t have those boring lulls that put a damper on jams. The quicker you’re able transition into other songs, the more interested everyone will be. Keep the energy high. Stumbling for songs is a real buzz kill. Think of it as a documentation of your knowledge. Next time someone says you know nothin’, you’ll have the numbers on your side.